I'VE BEEN A GOOD GIRL. It looks like Katie Speers is getting a gift from Santa Claus, who took time out from his busy schedule to drop in at Ballymoney RFC on Saturday morning where he handed out gifts to the Mini and Maxis.INBM51-14 117SC. Ballymoney RFC U18s hosted the league leaders, Ballynahinch, and in fine, crisp playing conditions won a very hard game of rugby by 25-15, writes Uel McDowell. As usual, the ‘Town lads started sluggishly and this was reflected in their play when they found themselves 12-0 in arrears after the first 15 minutes. Loss of concentration and missed tackles handed the Hinch lads two tries, one of which was converted. 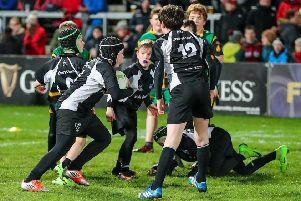 After a few encouraging words from their coaches, the Ballymoney lads upped their game and began to play their natural running game, by using controlled ball in loose play and gaining ground on their opponents. This proved successful when Aaron Brown ran a superb diagonal line on a crash ball which caught the ‘Hinch defence wrong-footed. Drawing two defenders, he off-loaded to the supporting Gary Pattison who dived over to score an excellently worked unconverted try. Just on the stroke of half-time Gary reduced the arrears to four points when he successfully kicked a long range penalty, leaving the half-time score at 12-8 in favour of the visitors. Following a constructive pep talk at half-time, the Ballymoney lads began where they ended the first half by attacking and keeping pressure on the ‘Hinch. From a line-out and drive to the ‘Hinch line by the ‘Town forwards, our number eight, Matthew Johnston, scored a great unconverted try from close range, to give us a marginal 13-12 lead. The ‘Hinch then went ahead when they converted a penalty following an infringement by the ‘Town pack to put the score back to 15-13 for the visitors. GIFTS GALORE. Some of the many Mini/Maxi rugby players, who were at BRFC on Saturday morning to received gifts from Santa Claus.INBM51-14 119SC. This setback did not unsettle the Ballymoney lads and from the restart they pinned the ‘Hinch back on their twenty-two line. For a few tense minutes both packs of forwards battled it out, and from a ruck the ever-alert Matthew Bell quickly passed the ball to an overlapping Andrew Young, who ran in from twenty meters out to score another superb unconverted try out wide, giving the lads an 18-13 lead. The ‘Hinch retaliated and hemmed the ‘Town lads in their twenty two with only stern and resolute defence holding them at bay. A team re-shuffle by the ‘Town, following an injury to centre Jack Kane, did not unsettle the lads as they kept up the pressure on their opponents. A long clearance kick by outhalf Andrew Young pulled the visitors back into their own half enabling Chris Campbell to steal the ball and pass it to the supporting James Wilson who ran in from ten metres out, holding off a ‘Hinch defender to score another good try which was converted by Gary Pattison. In the dying minutes the ‘Hinch threw everything at the ‘Town, who stood firm to defend their 25-15 lead and win against a very formidable Ballynahinch team. All of the ‘Town U18s played some excellent rugby, following their shaky start, and hopefully they will manage to maintain this momentum. The forwards must be commended for their ball-winning in all phases of play, particularly Man of the Match, Cundan Chaudhary, who covered a massive amount of ground, supporting and winning loose ball. The team travel to Lisburn this Saturday, December 20 and are looking forward to their next encounter.